Father James Maher was the subject of a lecture delivered by Prof. Donal McCartney in 1994. The lecture was published by Michael Purcell in "Carlow Past and Present" 1995 edition. SIR, You have called the attention of the public not long since to the expulsion of the peasantry from the townland of Slyguff. Would to Heaven that the cruel depopulating system were confined to one property, or one parish only in this ill-treated county. The extent to which the system has been carried, is a subject upon which the Government and the public ought to be well informed. Permit me, therefore, to publish, through the columns of your journal, some afflicting details of the working of the system upon a small estate in the parish of Milford and Ballinabranagh, in this county. What will become of these poor creatures when thrown upon a county where there is no provision made, even for the poorest of poverty 's children? Where will the aged widow Brien, when driven from her home, lay her weary head? With whom will she pass her few remaining days? - with her children? Alas! no, her sons, Pat and John Brien, her only sons, with their eight motherless children, all under fourteen years of age, are themselves in a few days to be reduced to the condition of less wanderers. 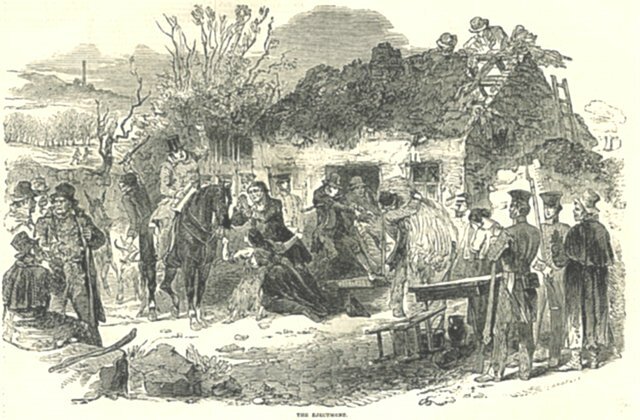 Her daughter, the wife of James Hughes, with her infant children, have been a week or ten days since driven to the road; and her sister-in-law, the widow Henesy, is also in the number of the proscribed. Oh sir, it is I fear, reserved for the wretched widow, in her eightieth year, to see herself and every one that bears her name, her whole race driven from the habitations of men, expelled without offence, un-convicted, nay. It is not here asserted that bona fide arrears were not due by some of these families, or that their landlord had not a legal right to eject them I bare fact of their being turned to the road, is alone stated. Some oft since they have been driven from their homes, worn out by misery, hi gone to their grave. One died in an hospital in Dublin; another was sent to the Carlow Lunatic Asylum; others have contrived, by begging through the country, to protract a wretched existence. Some have built temporary huts within the views of their former residences, or made dykes of ditches, where they have lived for months in misery, which it is impossible to describe. Amongst those driven from their home, is Ellen Commons, ejected for non-title, after having paid her rent for about thirty-seven years. During her occupation, she built a house, which cost her £14, for which, on quitting the premises, she received £1, and for giving peaceable possession, 2. Her poor sister, who lived with her, has been for eight years mostly confined to her bed, labouring under both bodily and mental in firmity. The loss of her home (for she was not insensible of what occurred), so increased her malady, that she has been since considered a fit subject for a lunatic asylum, in which, as stated above, she at length found refuge. Besides the ejected and those noticed to quit, twenty two electors on the same estate, most unfortunately for their own interests, have had the virtue, in those evil days, to support a Liberal Government by their votes at the hustings. For such an offence a most harassing war of citations, latitats, and subpoenas, &c., has been carried on against them, and has brought many of them to the verge of ruin. Their petition lately presented to the House of Commons, by Mr. Wallace of Greenock, will give some idea of the extent of their sufferings. This document eminently deserves the public attention it shows how far the people, for daring to advocate Reform, can be legally persecuted how they may be teased, and goaded, and robbed of their property, under the sanction of law. The spirit in which this war has been conducted is best collected from the tone and manner in which hostilities were proclaimed. In open court the landlord solemnly swore, with uplifted hand to Heaven, before me and others, that he would exterminate his tenants who opposed Toryism, were twenty years necessary to effect his purpose. The war has since proceeded, as appears from the petition referred to, in a manner every way worthy of the spirit in which it was undertaken. It is impossible to estimate the extent and intensity of the sufferings which these 228 individuals, on one small estate, have endured within the short period of two years. Oh! it is monstrous; it is a crying sin a sin that might bring down the vengeance of Heaven on a nation that landlords should have the power, as in Carlow and other places, of sending the wretched occupiers of the acre to starve. The oppression of the people in this country has very nearly passed the limit of human endurance. The cup of bitterness is filled to overflowing. The landlord, churchman, and attorney, united together in an unholy league, have sorely tried the peoples patience. Acting upon the advice of that clergyman (the Rev. M. Beresford), they not only assert their right to rent and tithe, but they seek the expulsion of the peasantry from the lands of their birth lands which they cultivated before their oppressors had a single acre in the country. "I trust (said the patriotic and reverend gentleman, Marcus Beresford) that every good and faithful minister of God would sooner have potatoes and salt surrounded with Protestants, than live like princes surrounded by Papists. "I quote his words from the Evening Mail. This oppression, ere long, will produce its natural fruits. The hunted cottier will turn when too hard pressed, and revenge himself on his ruthless pursuers. Sheridan has expressed the idea "wherever the heel of oppression is raised, trodden misery springs up, and glares around for vengeance. "But a few days since a fine athletic fellow, but worn by sharp misery to the bones, said to a neighbouring parish priest, don t blame me, sir, if I do wrong, for I am starving. My own misery I could perhaps bear, but I cannot bear to see my wife and children famishing. Their cries tear my very heart. I know not what I shall do. The law, it is said, is the protection of the subject. What law, I should be glad to learn, protects or recognises the rights of the poor? "If I obey the law." said an oppressed tenant, "I will be turned out to starve, by violating it, I will obtain a jail allowance and a roof to shelter me." The country is made to feel and know that other classes of men have their rights. All the courts of law; judges, lawyers, attorneys, proctors; all the disposable troops of the kingdom horse, foot, and dragoons (what servants of the apostles of Christ!) seem at present to exist for the sole purpose of vindicating the rights of sinecure churchmen, a third part of which rights are notoriously composed of the wrongs of the poor. On the other hand, the protection of the poor mans right seems to be no ones business. Now and then the priest raises his solitary voice to protest before God and man against the oppression of his fellow-creatures. But it is Vox Et Praeterea nihil, whilst the whole business of the government is compelled to stand still until the church is gorged with the tenth of every man's possession. Teaching others to despise the things of this world, she claims the full tenth of the peasants estate the inheritance which he has in the labour of his hands, and the sweat of his brow - the tenth of his potato pit, the only barrier between the poor man and starvation. What will the Legislature do to save us from impending evils? Are the constituted authorities armed with no power to save from starvation a quiet and suffering people? Have landed proprietors a clear right to condemn to any degree of misery or destitution they think fit the labouring population? We have seen, and every day see, power wielded in full might, and with all its resources, in the cause of church exaction, against a half-naked, half-starved peasantry. When shall we see the might of the government put forth in defence of an oppressed, a cruelly neglected people? The exertion of the Catholic clergy to preserve the peace, and suppression of outrage, will not, I greatly fear, be much longer successful. Oppression in this county has very nearly reached the point which makes the wise man mad. Hundreds amongst us are literally famishing. It would be vain to attempt describing their misery. On one morning of last week ninety six persons applied, personally, to me, for relief. I have taken their names, and will, with your leave, publish them, at a future day, in the Poit. The number of applicants was not unusually large. The farmers, who alone seem to have any bowels of compassion for the poor, harassed by the exaction of rent on the day it becomes due, and plundered in the name of religion by the Lay Association, have no longer the means of relieving them. Outrages, the commission of which both the oppressed and oppressors will have to deplore, will be the result of this cruel treatment of the people. Veniet dies irse, calamitatis et miseriae, dies magna et amara. Well as you know the Catholic clergy, yet you can scarcely imagine what efforts we have made and are making to keep society together. Denounced though I have been a thousand times as an agitator, yet I am every day employed in exhorting men to have patience. I will not be suspected of admitting the justice of the sinecure parson s claim to the tenth of the farmer s industry. The peasant, says Grattan, is born without an estate: he is born with hands, and no man has a natural right to the labor of those hands, unless he pays him. Holding, as I do, this doctrine, yet for the sake of peace, and to save honest men from utter ruin. I have paid, within the last month, the full amount of the parson s claim on four Catholic farmers. They were unable to pay it themselves. The parson insisted on the full amount of his bond the attorneys and Lay Association were already prowling about for their prey, and were the poor farmers as friendless as they were pennyless, they should have gone to the road. This, sir, is an unnatural state of things. The Catholic priest, who has a large flock to attend who has many and laborious duties to perform who is every day at the bed-side of disease, much of which is brought on by want is obliged to give what he receives for himself and the relief of the distressed, to the non-resident and sinecure parson, who renders nothing to the Catholic, save offence, for the wages he receives, to which, before God, he has no right, and in consenting to receive which he is guilty even of great wrong. This letter, I regret, has already become too long.